Fire. One of the five elements that has been worshiped by cultures and religions across the world. Our ancestors are supposed to have discovered fire (or rather, discovered the use and control of fire. They must have seen fire in many of its forms - volcanic eruptions, forest fires, lightning and so on, (although one wonders whether they could associate fire with lightning.) Fire has been essential to the survival of man through his journeys across continents and across ice ages. In Tarot, the element of fire is associated with the Suit of Wands and represents the world of ACTION. In so many ways, action has been essential for our survival too. Thoughts and feelings are important, they help us understand the world around us, but what use are they if not supported by tangible action? 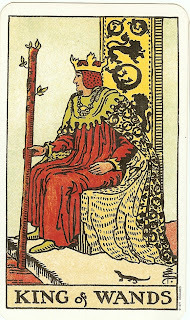 As in all the other suits of the Tarot deck, the King is the epitome of the represented element. The King of Wands stands for strong, positive, purposeful action. But don't think that this King is ONLY about action. Its not that he cannot think or feel. Like you and me, he is equipped with intellect and sentiments, so also he is possessed by all human follies. He can of course think and feel, but the one thing that sets him apart from others is that he does not let his thoughts and feelings become liabilities that will impede action. So he is not reckless or impulsive. He is just decisive. He has fire in the belly that makes him get up and finish the job without procrastination or postponement. Just like fire, the element he represents, he has the ability to transform. Fire can burn, evaporate or even melt solid objects. By doing this, fire can convert solid rocks into lava and make them flow down the sides of volcanoes. It can melt steel and make it suitable to be forged into a sword. The King of Wands is thus a mobilizing force for everyone around him. In fact, he can simply not tolerate inaction. Laziness will cause him to be angry. But he will also not waste his time persuading the lazy man to get into action. He will tell so once or twice, but he has no time to waste on people who don't emulate his example. This great burst of energy, impatience and sense of urgency can also prove to be his shadow side. In his foresight where his vision is fixed ahead, he can lose sight of whats next. Not that it matters to him, because he has the ability to overcome small challenges, niggling starting troubles. But then, this can make him arrogant and insensitive to someone else (for a genuine reason), who is be as forthcoming with action as he is. His quick retort would be "if I can do it, why cant you?" I suspect that he wont even ask this question, because he does not have the patience to wait for an explanation. He would rather say "since I can do it, you should be able to do it too." Remember that in spite of all his impatience and intolerance, he is still the KING. So he has surely not got there by a stroke of luck of sheer chance. He has acted upon his thoughts, exhibited a positive enthusiasm for creating a better future for himself (and for his people too, I am sure. He is not a selfish King.) He is a King who walks the talk. Creative, outgoing, belligerent, bold, charismatic - he leads by example. The four court cards in each suit can also looked at as those representing Experiment (Page), Explore (Knight), Experience (Queen) and Express (King). The King also represents the masculine element, which naturally works from inside to outside, not the other way (from outside in, which comes very naturally to the feminine element. Note - the picture shows the Knight of Wands from Aliester Crowley's Thoth deck. The nomenclature in this deck is different and can confuse newcomers in this exploration. The more conventional court cards of Page, Prince, Queen and King become Princess, Prince, Queen and Knight respectively in the Thoth deck. In most traditional or conventional decks (like the rider Waite) all Knights are riding a horse and all Kings are seated on a throne. In the Thoth deck, all Knights (read kings) are again on horseback, but they represent the peak for that element (Fire in the case of Wands). I believe that this is particularly relevant to the King of Wands. I would rather see this King ride forth on his steed rather than sit comfortably in his throne (shown from the Rider Waite deck here). True, compared to the other three kings, this one sits on the edge of his throne rather than relaxing in it, signifying that he is ready to spring into action. The card asks us to look at our world of action and goal orientation. In a reversed situation, it should make us look at those areas of life where we are looking for reasons for not acting. Yes, maybe some reasons that are not within our control do become unsurmountable hurdles, but certainly there are factors which are clearly WITHIN our control, yet we continue to externalize, give excuses and forget to act. I wonder what the cards have to say about your blog. Would love to read a post on that. @ Susan and Shas - Wow, thanks. I didn't know that people would actually be seeing this blog! It has been gathering dust for long. I promise I will make this more regular. Thanks for kicking me out of my laziness.